It was inevitable that Google would enter the tablet race. Google launched the Google Nexus 7 tablet this year in July, and according to press releases, it has been selling very well… or has it? When it was launched, it apparently sold out very fast in stores, but sales results were not reported. Or is this a marketing trick to create scarcity and a best seller image? This is one of the oldest marketing tricks in the book, as it has been used by toy manufacturers for years at Xmas for toys that kids want but the parents can’t get in the store. This smoke and mirrors marketing tactic is part of the Apple playbook for a product launch that includes lineups at stores. This proves the theory that brand equity can sell a lot of product, as this identical tablet is also available through ASUS and coincidentally they have a tablet called Nexus 7 available on its website (ASUS, a Taiwanese-based company, had a 3% market share of tablets shipments in 2011). Google contracted ASUS to build this tablet and it appears all they did was slap their name on it and said it as theirs as the ASUS logo is on the review device. Car manufactures have done this in the past as Japanese cars were disguised as domestic cars with a new logo. It has been estimated that Google did sell 2-3 million units during the launch and a sales forecast of 4-6 million units for the year according to the blogosphere. I have to admit, you have to be impressed by Google as they are a formidable company from its origins in the search business where they have a commanding lead. Their other products include YouTube (video), Gmail (email service), Android (mobile OS), Chrome (browser), Google+ (social media), Google Play (app store), Google Maps/Navigator (travel app) and now they have entered the hardware market with their purchase of Motorola and now a Google branded tablet. Their stock reached an all time high of $750.04 on September 24, 2012. So the company is still growing. The gadgets for this blog for tablets will be based on a scorecard and will be evaluated on these 4 criteria to arrive at the score. $209 Cdn ($199 US) in the Google Play Store for the 8 GB model. What makes this tablet stand out is the quad-core processor which makes it the fastest tablet on the market at this time. ASUS, the manufacturer of the tablet, launched quad-core tablets last year with their Transformer brand. 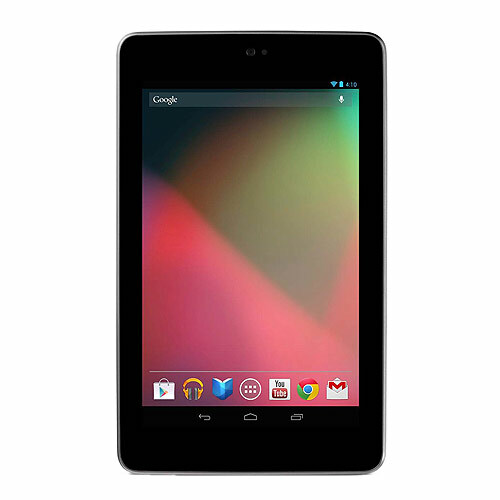 Previous tablets reviewed in this blog were typically dual core tablets. The number of cores relates to processing speeds and the ability to multitask and more cores means faster speeds. The tablet comes with both wifi and Bluetooth. The 7-inch form factor is my favourite size for mobile reading so the readability of content was no problem. Since this is a Google device you have access to the 600,000 apps in the Google Play store. My only concern was that the device did not work well in the outdoors — when I tried to use the Google Navigation app in my car I could not see the screen, and this needs to be improved. The only device that I have tested that can do this is the RIM Playbook tablet. The other bugs I discovered was the device did not go into landscape mode when it was taken out of the box, it required a software upgrade download to fix the problem and if you are not a techie this can be intimidating. Another setback was that the camera did not work (who ships a product that does not work? Oh, I know Apple does as the iPad is a product where video does not work on certain websites) as it required you to download a camera app from the app store. The price of $199 US is the sweet spot for consumers, but it will be cheaper as I have heard 7” tablets from RIM for $150 so the market is getting even more competitive. Using the RIM Playbook as a benchmark (I gave it a 5 out 5 in my review earlier this year) for what I want to see in a tablet the Google Nexus 7 was lacking as it came with only one camera that did not work out of the box, it does not have a file management system so I cannot transfer my work files, it only had a USB port (where a HDMI port should be included). However, the Google Navigation app with voice instructions is a great app (but that is included in all Android devices) that will definitely make me forget about using other GPS navigation devices such as a TomTom. While this is a good device, it is not the best one in my opinion, no matter what the marketing hype suggests. Ryan Winsborrow from www.nerds4hire.com, my technical adviser, did not want to give it back to me when I gave it to him for review. He liked the speed and responsiveness of the quad-core processor, it is very lightweight at 340 grams and the convenience of the 7-inch form factor as you can hold it in one hand. His favourite use in the living room was using the TV guide website, so he did not have to go to the cumbersome TV guide channel from his cable company. But I expect that this device will only get better with the next version that comes out, as the first one always has bugs and this device is no different. 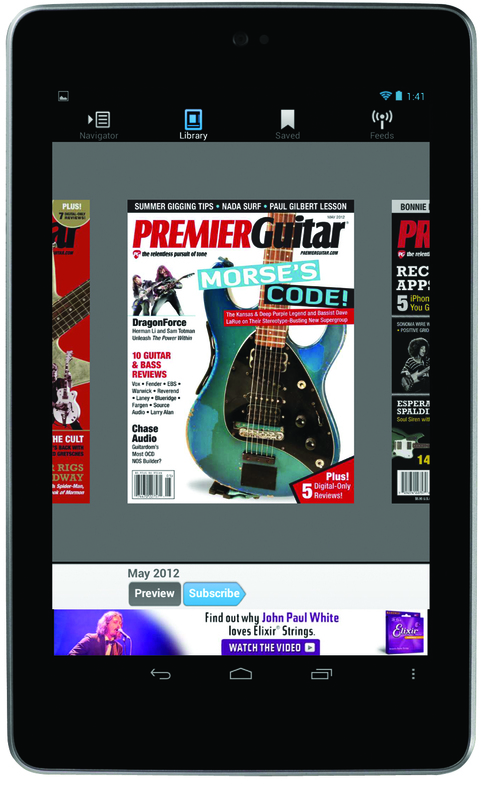 For magazine publishers, you will need to get in the Android market with a magazine app, optimized browser digital edition and/or mobile website solution for the-7 inch screen soon if you have not already done so. The competition will only get more fierce in the future for consumer eyeballs as the growing popularity of the 7-inch form factor at this price point will only accelerate its adoption.